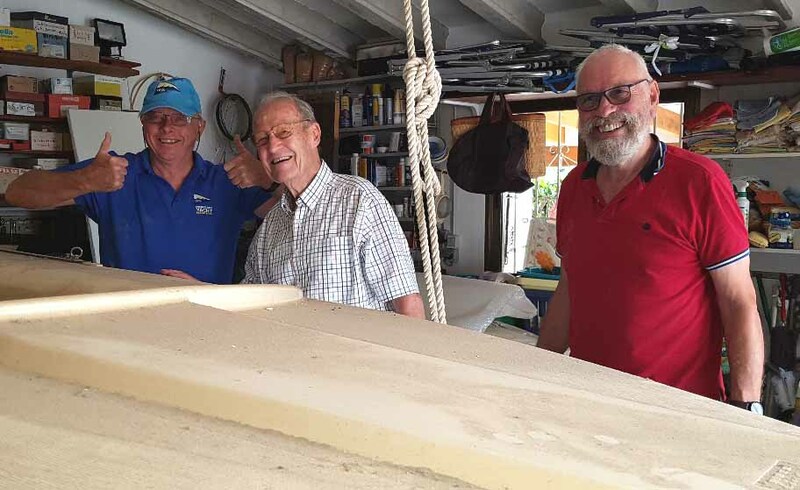 This week the CBYA Dinghy Section made another giant step forward in its recovery from the vandalisation of our boats last year…..
Richard Evett, Dave Peachy & Bob Gordon have repaired, and re-launched, our Flying Fish dinghy “Yelly”!! 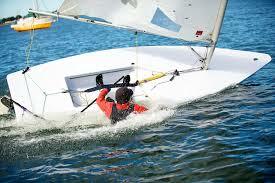 WHAT TO DO WHEN YOU CAPSIZE…. Generally you can feel when the boat is going to capsize. 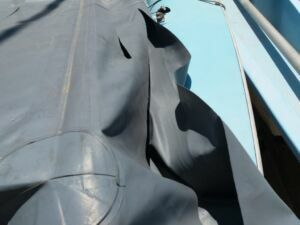 If you can sense it early enough, you may have time to quickly ease the mainsheet, and scramble over the side, placing your weight on the centerboard just as it reaches the horizontal position (be careful not to fall into the sail, as you may tear a hole in it, or worse off, hurt yourself). 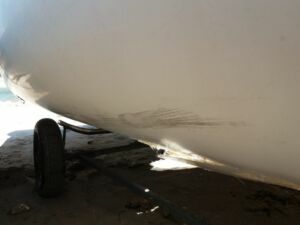 Don’t put all your weight on the end of the centerboard, as this may cause unnecessary stress on the fin and hull. Rather, put your feet on the centerboard close to the hull, grab the deck where it meets the hull, and lean back. As long as the mainsheet is eased, it should pop back up fairly quickly. When it does, quickly get back into the cockpit, sort out the ropes and tiller, get your bearings, and head off once again. The sun was shining, the sky was blue, there was a gentle breeze and all was true. Although a little chilly, conditions were perfect. 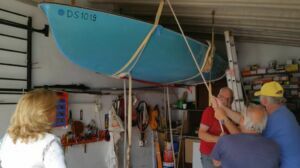 Dave Peachey turned up with a new inflatable dinghy and new outboard, which he had apparently purchased 5 years ago, but never used. 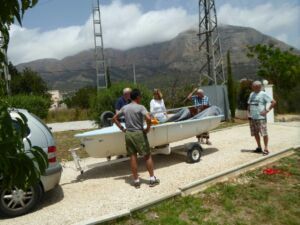 After some initial problems with the outboard bracket, all was sorted out, and he brought the boat round to the El Portet dinghy hard. By that time, we had launched our ‘borrowed’ safety boat, and Paul Maudsley was out on the water warming up the outboard. 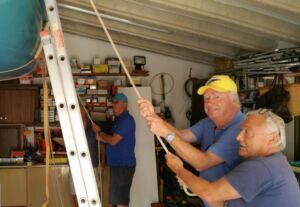 After a short time of making some rigging adjustments to Wally, Richard Evett took his first trip with CBYA crew members who wanted to learn, but were not experienced sufficiently to sail on their own. He repeated this several times over the next couple of hours, and several members benefited from his experience and tuition. We then rigged one of the Lasers and after some ‘gentle persuasion’ Dave agreed to give it a go. He went out twice and came back with a ‘big smile’ and a lot more confidence. 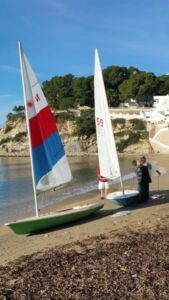 15+ CBYA dinghy sailors braved the traffic and crowds to gather at El Portet beach on New Year’s Day to sail our dinghies. The special fee for those sailing was a bottle of cava! 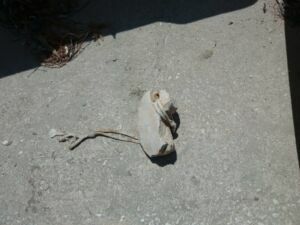 They weather was ideal – sunny, warm and light breezes. We launched the 420, a Laser and a safety boat, and a good time was had by all. The CBYA Dinghy Section Sails Again! 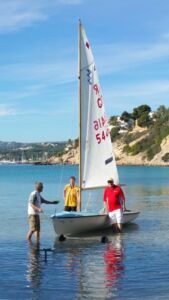 The CBYA Dinghy Section re-launch on Tuesday 4th December was a BIG success. 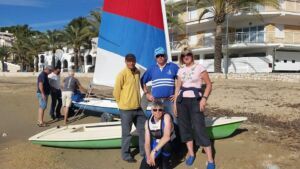 The weather and sailing conditions were ideal, and over thirty members turned up to support the event. We launched both Lasers, and the 420 (without a gib due to the lack of a luff wire), and Tristan brought his wife (Diana’s) inflatable around in support. Richard also brought Tricky D, with Peter Knowles as crew. 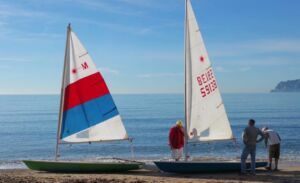 Two Laser Dinghies donated to the CBYA! Having read about the recent kind donation to the CBYA of the Stern dinghy (click HERE for details) , Dirk Mittman contacted us to advise that he would like to give his Laser dinghy to the CBYA as well. A working group comprising Dave Peachy, Rod Simpson, Chris de Boer and Hugh Epsom duly collected the dinghy, and transported it to safe storage location until we can restart the CBYA dinghy section. We have also acquired another Laser which was formally owned by Diana Jarvis! 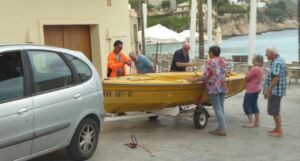 As a direct result of the local press coverage of the vandalisation of the CBYA dinghies at El Portet beach (https://cbya.org/malicious-attack-on-cbya-dinghy-section/#more-7697), the CBYA has been given a Van de Stadt “Stern” dinghy by a very kind, keen sailor named Herr Modersohn. 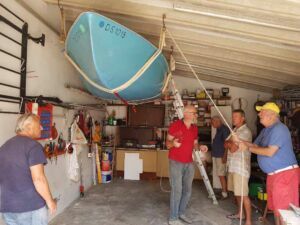 We arranged a working party to collect the boat and relocate it to temporary safe storage until we can arrange a new secure location from which to operate the dinghy section. 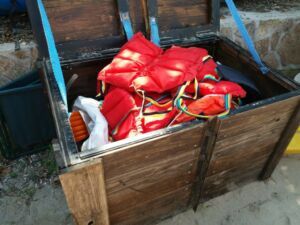 Many thanks to all CBYA members who came along to help with the dinghy relocation on Friday 25 May. 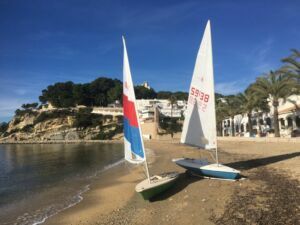 They have now all been removed from the El Portet beach, and have been relocated to a temporary secure location whilst we review our options, and related costs, for relaunching the CBYA Dinghy Section. If anyone has any suggestions regarding an alternative, secure location where we can store our dinghies, trailers, a safety boat, an outboard motor and other associated equipment, and easily launch, sail and recover our boats, please let us know by clicking HERE. 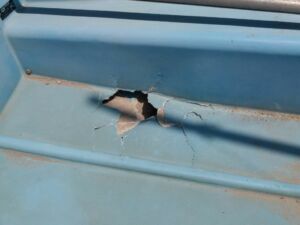 Malicious Attack on CBYA Dinghy Section! 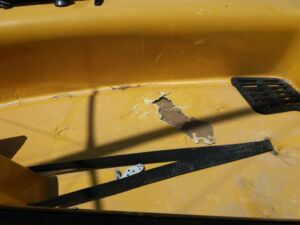 CBYA dinghy section suspended until further notice due to a malicious attack! 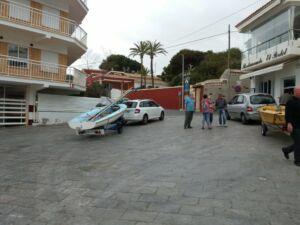 Those who turned up for Dinghy Day on Wednesday 9th May had an unpleasant surprise. 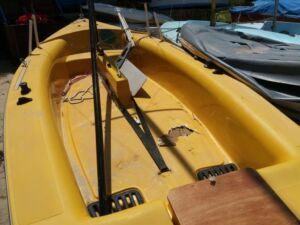 All three dinghies had been holed, our inflatable safety boat had been slashed down both sides, and our latest replacement outboard had been stolen, despite being secured with a very strong chain, and being locked in our strongbox. 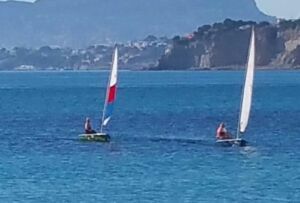 There was no damage to any of the other boats on the El Portet beach, so obviously the objective was to put the CBYA Dinghy section out of action.